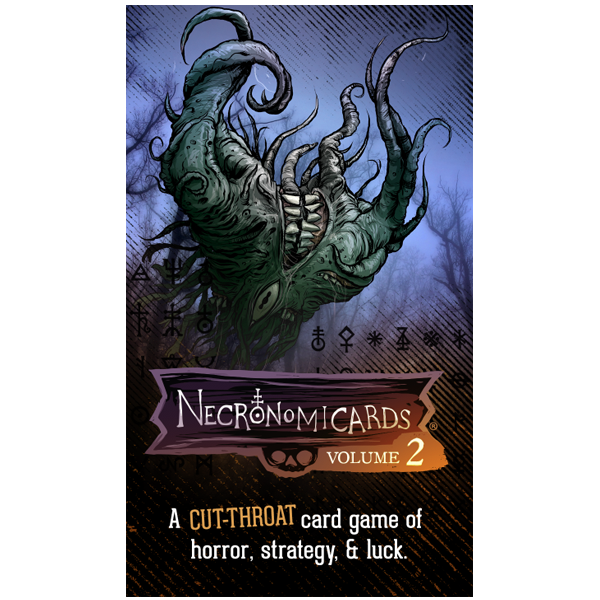 NecronomiCards Vol 2 adds new Summon cards, a whole new set of strategic defensive abilities called Relics, and other additions and adjustments to make games more fast-paced and fun. It can be played either as an expansion to the original game that allows for up to 8 player games or as a 2-3 player stand alone game. 3.5X Funded on Kickstarter ($10,000 goal)! NecronomiCards is simple, but not easy. Match together magic symbols across hands of Spell cards in order to Summon mythological creatures, ancient gods, and grotesque demons. Use the abilities of those powerful creatures to crush your opponents' plans. The first person to play seven Summon cards wins. Boom. It's that simple. Match combinations of magic symbols to Summon dark creatures and crush your enemies (and friends). Successfully funded on Kickstarter and featured in the Cards Against Humanity room at PAX West 2016. 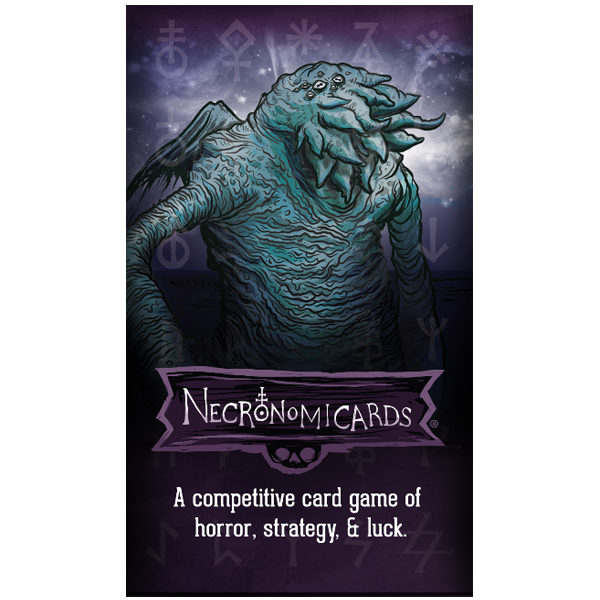 The first expansion for NecronomiCards works as a standalone game or allows for up to 8-player games when combined with Vol 1. Adds 20 new Summon cards, new Spell cards including cards that already contain matching pairs, and a new defensive card type called Relics. "The game looks amazing, and is very fun to play... Other Kickstarters could learn a few things from you." "The art is incredible, and the gameplay is fun and fast-paced." "If you are looking for a new “take that” game with awesome art then look no further." "NecronomiCards is a very easy game to learn and is highly replayable." "Tried this at PAX West and I had to buy it. GREAT game!" "Andy Hunt's Lovecraftian offering really hits a home run...or a Cthulu tentacle...or something. The short answer is, yes, buy this game, it's totally fun!" "Both a game and arcane eye-candy." "I can’t say enough good things about the art in this game." "I would recommend NecronomiCards to anyone looking for a quick filler game with great art, simple rules, and great replayability."